Rabbi Elie Kaunfer has the answer to both. 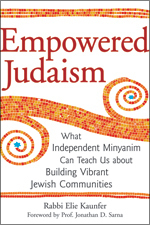 In Empowered Judaism: What Independent Minyanim Can Teach Us about Building Vibrant Jewish Communities, Kaunfer analyzes the new (and not so new) phenomenon of the young independent minyan—or, what my friends are doing praying in a living room on Friday nights. According to Kaunfer, the current generation of Jewish people in their 20s and 30s grew up in a particular set of circumstances that have left us feisty and inspired. We’re tech savvy; we’re risk takers; and if we feel disconnected at a traditional shul, then we don’t need you—we’ll make our own prayer groups! The minyan that Kaufner himself started turned into Kehilat Hadar, a community with several hundred people regularly meeting for Shabbat services and all major Jewish holidays. In his book, he writes about what inspired Kehilat Hadar, how it developed, the challenges the organization faced as it grew, and how Kehilat Hadar is in a sense emblematic of hundreds of other such communities of young empowered Jews world-wide who are doing the same thing. Kaunfer’s analysis of the minyan phenomenon is truly insightful, and he clearly has a wealth of knowledge on the subject. He offers many great explanations of where minyanim came from, what they do, and the struggles they face and will continue to face in coming years. There were a few points in the book where I was unhappily reminded that Kaunfer is a rabbi and not necessarily a writer — there are moments that feel like simply bragging about the community he started and moments that feel a bit pedantic — but overall I appreciated the subject matter so much that I didn’t mind. So while the style is iffy, the content is gold, and if you don’t know about this stuff, you should. Get the book for the info, and email me for your nearest living room minyan location!